Here is a favorite Holiday candy-cookie, we make every year. White chocolate with peanut butter, marshmallows, and Rice Krispies. Creamy, smooth decadent and a divine confection. Plus the bonus making this, they're a no-bake treat. Back in the 1970s, we loved a candy called boyer smoothie cups, maybe some of my readers remember them. I was a huge fan of those. Well, these reminded me of those little candy cups ( just minus the marshmallows) when I first made them back in 2009 they brought me back to that taste of my childhood favorite candy bar. This year, I decided these clusters needed to be dressed up for the Christmas holiday. These are the perfect addition to our candy or cookie trays. These are a delicious sweet and savory cookie but more like a candy. They have a creamy texture that melts in your mouth and addicting. The only form of cooking is using the microwave to melt the chocolate and peanut butter together. What could be easier, and just around 5 ingredients if you don't count the festive sprinkles! These Passed with Flying Colors! When I made these years ago, they passed with flying colors immediately and the family asked for them time and time again. in our family. The sweet/salty flavors these have been quite unique to anything I had ever made before. White chocolate/dry roasted salted peanuts in combination are the perfect marriage of flavors. Not to mention there’s that crispy/gooey combo of the marshmallows and Rice Krispies in every bite. I just love that light peanut butter flavor with the white chocolate coating. 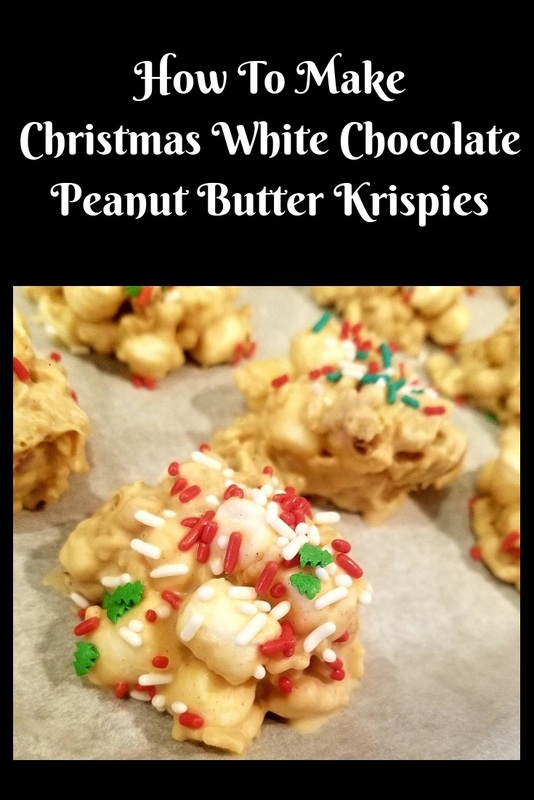 This recipe is so versatile for any holiday you make them for. You can tint them any color you want or better yet just add the coordinating sprinkles colors of the event. Pretty for 4th of July in Red, White and Blue sprinkles or Green for St. Patricks Day. Fun for the kids to make too since they're extremely easy to make. I always thought milk chocolate and peanut butter were the best ever combination but the white chocolate is a nice change. If you need to bring something to a friends house party or event, watch them disappear quickly make two batches! The actual confection of peanut butter and white chocolate when melted is so thin and it will easily pour over the cereal and blend fast. The taste of the peanut butter is subtle and not overwhelming and the Krispies have just the right crunch with the roasted peanuts. They are great for bake sales and other charity events too, they will sell fast! If you're not a big fan of dry roasted peanuts, try some others kinds of nuts you like. Almonds, pistachios or even pecans work very well in this recipe. For those with allergies to nuts, try substituting sunflower seed butter or soy butter even tahini and use the seeds instead of nuts. The white chocolate and peanut butter go great with other nuts combinations. I have also have used regular milk chocolate chips and those are delicious too. 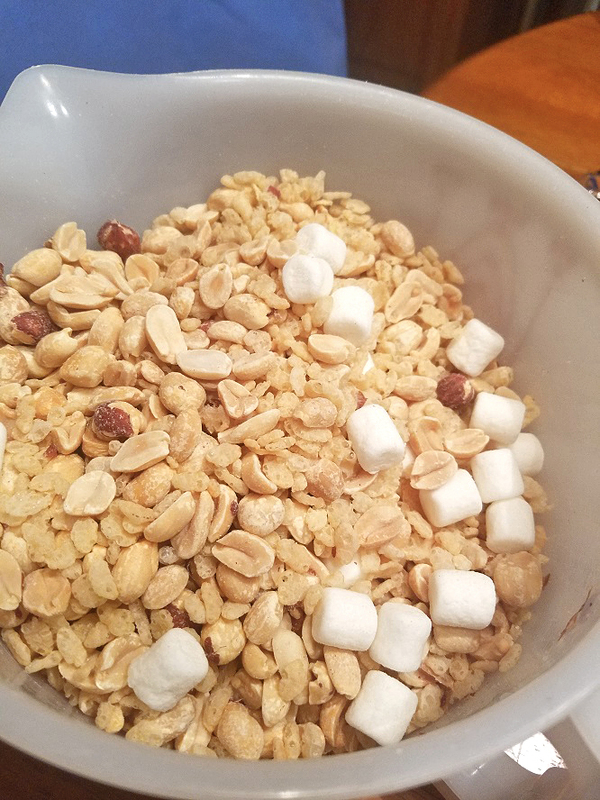 I like to use an extra large bowl for mixing the cereal, marshmallows, and peanuts with the chocolate mixture. It just makes it so much easier to stir the mixture and coat it evenly. Always remember to use a wax paper lined cookie sheet while they are drying, for the ease of releasing them to store. These usually stay fresh in an airtight container for around 2 weeks. If you're a rice Krispie treat lover this is such a nice change of pace. They are a sure winner in our home with that smooth creamy yet with a sweet and salty twist of flavors. If you have a peanut butter lover in the family, these make the perfect candy gift in a tin too! The best thing about this no-bake recipe is they are full proof. They come out perfect every time and I never have to worry about cooking or baking! 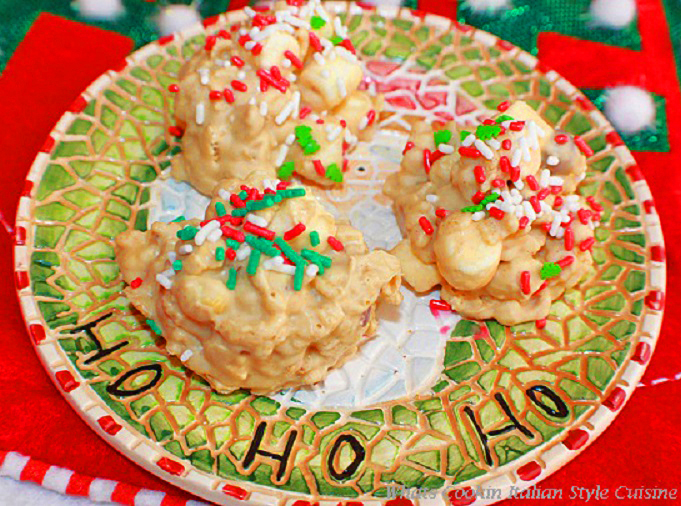 Watch My Quick Video Clip On These White Chocolate Peanut Butter Krispie Treats! These are white chocolate peanut butter cereal Krispie treat. They also have miniature marshmallows in them. 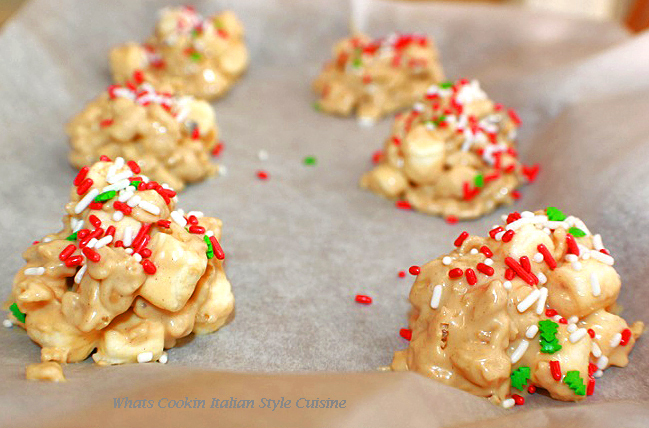 Easy to make and a festive Holiday treat for the kids and young at heart. In another large bowl, add the peanuts, marshmallows,, and cereal to that bowl set aside. 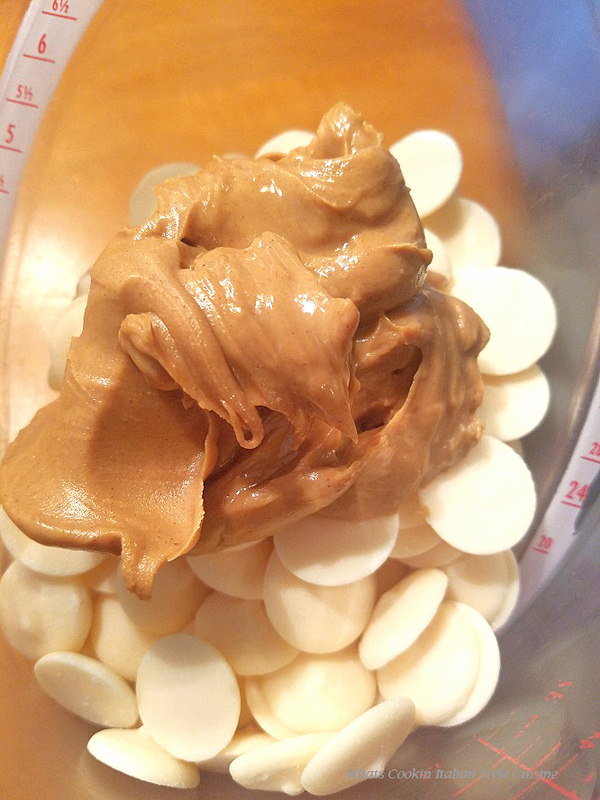 Place the white chocolate with peanut butter in the microwave for 1 minutes intervals. I did this twice, stirring in between times. When chocolate is melted and it will be very thin, keep stirring until all the chocolate is melted. 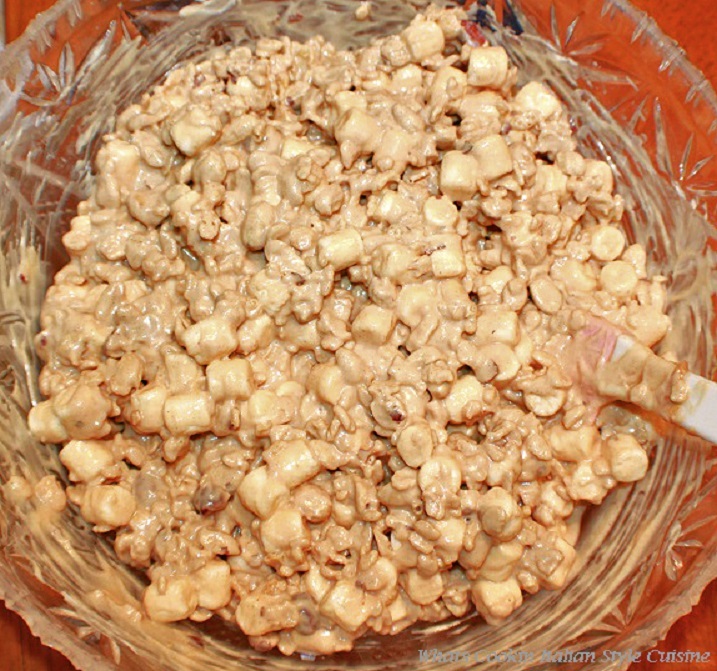 Pour this mixture over the second bowl with cereal, nuts, and marshmallows. Mix until all combined evenly. 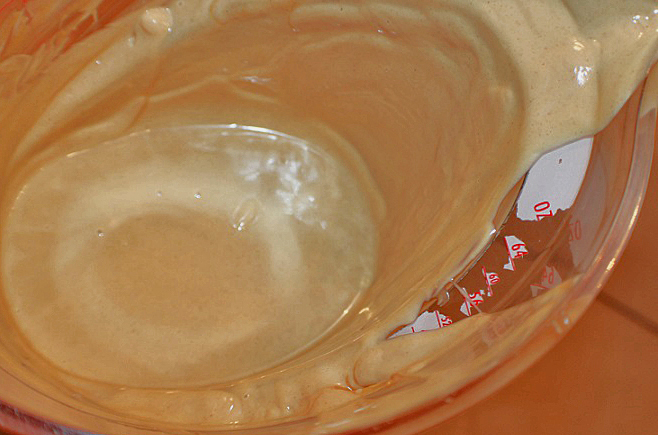 With your ice cream scoop, pack it tightly and release on to the wax paper lined cookie sheets. Sprinkle with Christmas sprinkles and let dry for around 2 hours. Peanut butter and white chocolate...I have to hide those from my husband or he might just eat the whole batch! These treats look so much fun and perfect for Christmas! Love that this is an easy to make recipe! Looks so festive, perfect sweet treat in the Christmas table! 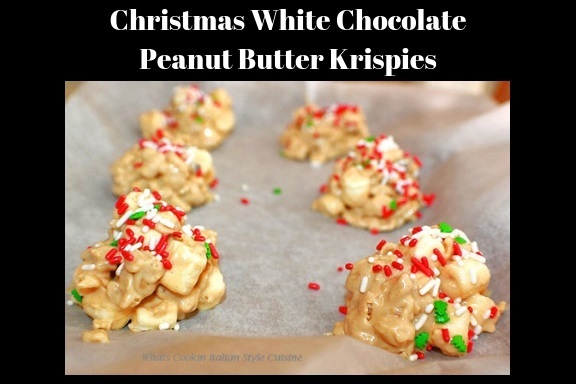 THese look like such a fun and tasty festive treat! These are so festive looking. I bet they're Santa's favorite. What is not to like about these addictive little treats - peanuts, marshmallows and rice crispies - yumm!! So easy to make and sooo delicious. White chocolate and peanut butter is the perfect flavor combination! My daughter will devour them in minutes! 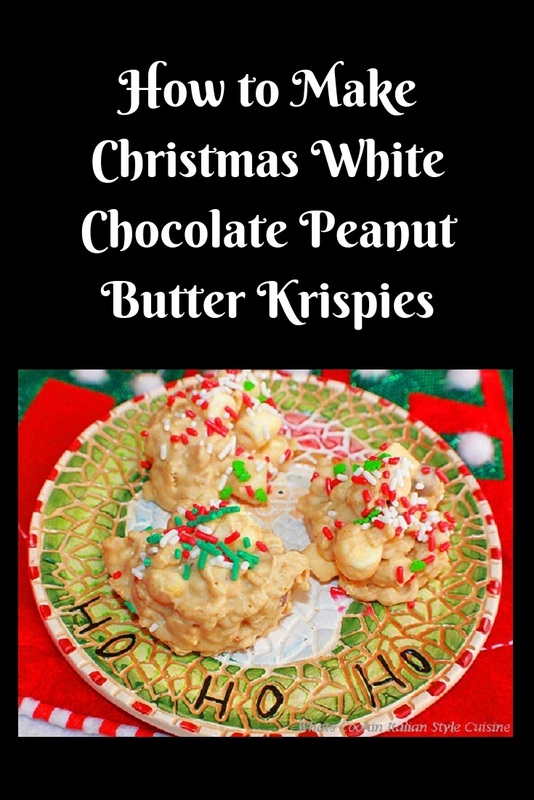 The addition of the peanuts and marshmallows sounds wonderful and these treats must be addictive and delicious! Mmm I bet the peanuts the rice krispy cereal are fabulous together!! Going to make these for our next family movie night. Thanks so much for the yummy recipe!! Now these are real christmas treat. I bet kids will love these. 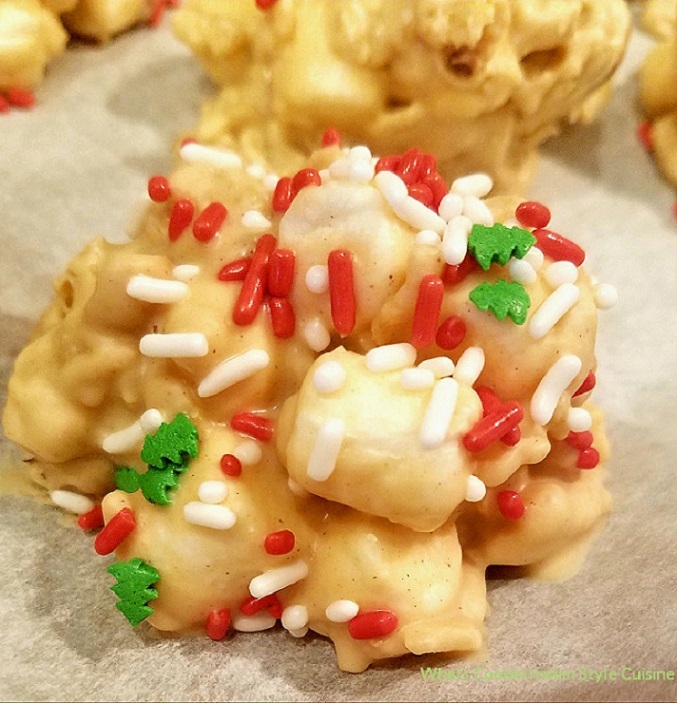 I love how festive these are and how easy this recipe actually is. Saving this to try. Like definitely. Great Christmas treat for sure! Peanut butter works great with it. Printing this off! I could eat the whole batch myself! !